Chinese opera is not a normal theme for a slot machine to cover, and as far as I know this is the only one to do so. Play’n GO was the one that got this idea, and the result is stunning. Graphics quality is at its highest in this slot machine, with a lot of great details being used for every single high-paying symbol that is used. I can’t say the same thing about playing cards, since those are on the simpler side, but even they have small flowers adoring them. The high symbols have images of the performers though, both men and women, and they’re shown dressed in rich clothing as they prepare to take on various roles. In the background, you can see a Chinese style building, the inside of one anyway. When you’re looking at a developer whose games are present at more than 200 online casinos, it’s clear that it’s extremely popular and that players appreciate their content. Play’n GO has the added benefit of owning a huge collection of games, over 200 of them overall. Imperial Opera is a good example of a new game from them, the impressive graphics being typical for the releases they put out. In a game that has 20 active lines, a starting point of $0.20 for the bet is normal. At the other end, you get a value that’s just as common in these slots, of $100. Those figures should give you a clue as to the line bet’s range, which is from $0.01 to $5. You can expect for this game to have 5 reels that get 20 active lines. They form their wins from left to right, same as 90% of the games you get to play right now. The unique Play’n GO betting system is employed. Several randomly activated special features have been introduced with Imperial Opera. One is called Harmony, and it selects 2-3 adjacent reels, to sync them and show identical symbols in corresponding positions. Crescendo is the second one, also activated at random, and bringing you 1-2 wild reels. The random factor is also part of regular spins, each round one symbol being picked by the game to be used stacked. The only one that can’t appear stacked is the scatter. That one spin, the chosen symbol will have an improved chance of forming combinations. Mega Symbols are far from regular features in slot machines, but they’re becoming more common, and they are present in this game as well. They may appear in this form at random, and they can cover up to three full reels during the special features. Gong scatters are mega sized themselves, but they can only occur during Harmony mode, with the synced reels helping. Get three reels to sync and show a mega scatter, to trigger 10 free spins. In those spins, you get the middle three reels synced and with the Showcase feature always on. The puzzle is complete by the presence of a wild symbol, showing the female opera singer. It forms combinations, or it is a replacement, but either way it’s a good feature to get. The mega sized symbols, the wild reels, the random stacked symbols and the synced reels all contribute and can benefit from the presence of wilds, the symbols which form the top paying combinations, of up to $2,500. There are a lot of opportunities to get multiple active lines occupied by these wilds. 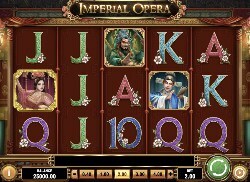 Imperial Opera is one of many impressive slots that you will find at a Play’n GO casino, and its graphics and features both help out with that.